Brenda Sue Bivens, age 67, wife of Mike Bivens of Stamping Ground, passed away in Lexington at U.K. Medical Center on Thursday, January 10, 2019. Brenda was born on May 30, 1951 in Scott County Kentucky to the late Willard and Flossie White Padgett. 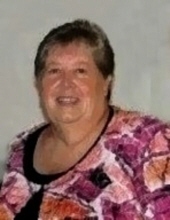 She was a 1969 graduate of Scott County High School, a retired secretary in the Department of Agricultural Economics at U.K, worked the front desk at the Amen House and was a member of Long Lick Baptist Church. Some of Brenda's favorite things were Christmas, fireworks and daffodils. Her first loves were her husband, family and her faith. Brenda is survived by her husband Mike, and her daughter, Shannon Bivens (Timothy) Grubbs of Stamping Ground and her grandchildren, Emily Russell, Sarah Gates, Samuel Grubbs, Luke Grubbs and Lilly Grubbs. She is also survived by her sisters, Sylvia Wilson of Porter, Maine, Marsha Wasson of Wapakoneta, Ohio, Connie Traxler of Tiffin, Ohio, Mattie Miller of Republic, Ohio, Linda Faeth Wojtko, of Vermilion, Ohio, Debbie Lewin of Kelso, Washington and her sister-in-law Sue Padgett of Georgetown, Kentucky. A Celebration of Brenda's life will be Friday, January 18, 2019, from 5 to 7 at Tucker, Yocum & Wilson Funeral Home. In lieu of flowers memorials may be made to Amen House, P.O. Box 211, Georgetown, Kentucky 40324. Online condolences may be made to the family at www.tuckeryocumwilson.com. To send flowers or a remembrance gift to the family of Brenda Sue Bivens, please visit our Tribute Store. "Email Address" would like to share the life celebration of Brenda Sue Bivens. Click on the "link" to go to share a favorite memory or leave a condolence message for the family.